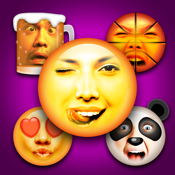 Emoji My Face: take selfies to morph faces into emojis & create your own custom design photo character avatar! This App Will TOTALLY MELD YOUR FACE — Photoshop/Morph any pic into 100's of emoji/emoticon stickers — your face, a celebrity’s face, your friend’s, your mom’s — or your friend’s mom! • SHARE on WeChat, WhatsApp, LINE, Twitter, Messenger, Facebook, Weibo, Kik, Text, Email, etc. — ANYWHERE you can PASTE IMAGE STICKERS or upload from your Photo Library! • PROFESSIONALLY DESIGNED "Photoshopped" FX! Don't just stick your face in a hole or just cut it out like with those lame apps! • UNLIMITED FUNNY FACES to create — Middle finger emoji? Yes! Duck face emoji? Do it! Vomit face, face palm, confused face emojis? YES! Any expression you want! Even dirty emoji, if you dare! * PLEASE NOTE * Apple does NOT allow any outside developers to add new emojis to your keyboard. They MUST be copy-pasted as stickers. Emojis have become a social phenomenon. We use them in our text messages, in our Facebook posts, and in our Twitter posts.